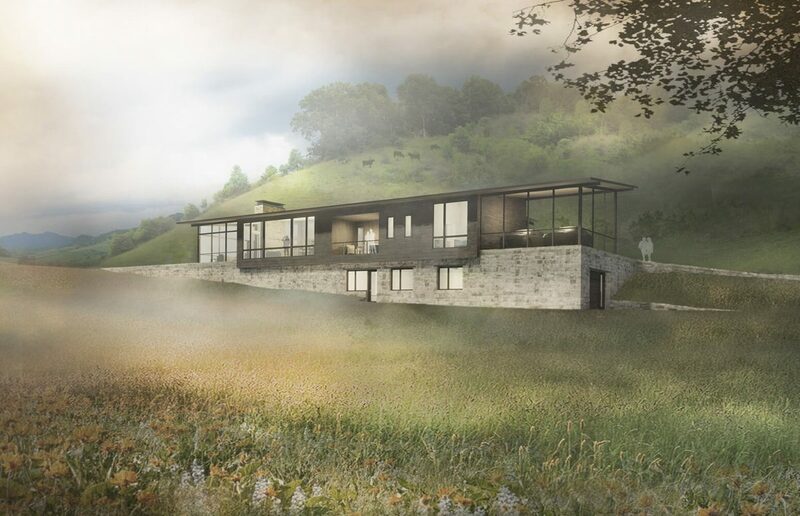 Our concept for this new home, located in a pastoral farm valley in Haywood County, North Carolina, expresses a nuanced personality that is light and modern as well as grounded and rustic. Charged with designing a home comprised of expansive windows while also respecting the landscape and existing vernacular farm structures, we sought to merge the modern with the historic. Taking cues from nearby context of barns and other farm out-buildings, the house is distilled to a single form, conveying simplicity and humility. Generous windows throughout the home achieve the client’s goal of capturing distant valley and mountain views, while the horizontality of the structure satisfies another primary goal: to restrain the home’s scale and diminish its impact on the landscape. Weathered wood siding and a simple, utilitarian shed roof blend the design with neighboring farm buildings while still conveying a decidedly modern aesthetic. The rolling knolls of the valley greatly informed the home’s location on the land. Prominent views inspired both its elevation on the hillside and the subtle pivot off the contour lines. 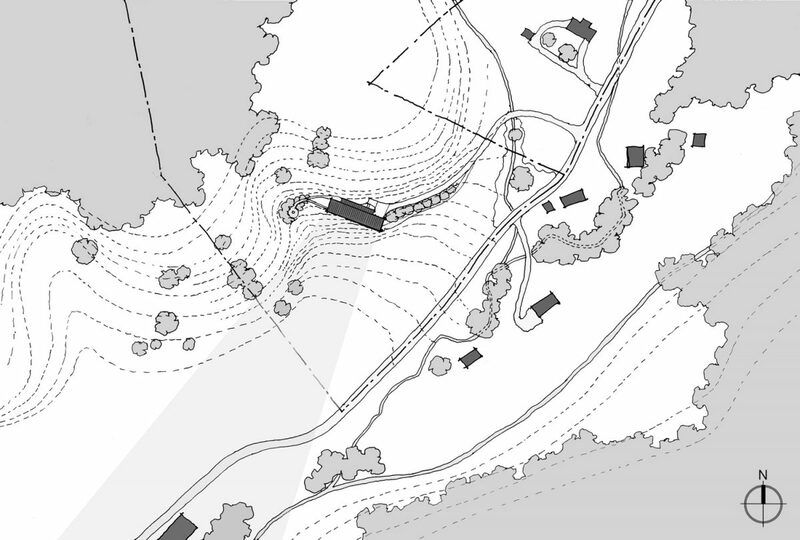 The house integrates with the hillside to preserve the site’s appeal as an open meadow. The main level rests on a monolithic plinth of native stone that slowly emerges from the slope of the earth—a nod to the historic ‘bank barn’ archetype. The steep hillside challenged us to design a comfortable, logical flow between the program’s spaces in a 1700 sf linear footprint. Our response delivers a house in which every space receives light and views from two and sometimes three sides. Capitalizing on the site’s solar orientation, the shed roof slopes downward toward the South, partially shading the main spaces from direct summer sunlight while maximizing indirect light through high windows on the northern face. This site placement and footprint also provides good orientation for installation of PV solar panels. Despite the home’s modern characteristics, it weaves respectfully into the context of older farm structures through form and materials. With this home, we hope to not only satisfy the client’s wish for transparency and views, but also instill a sense of history and permanence.